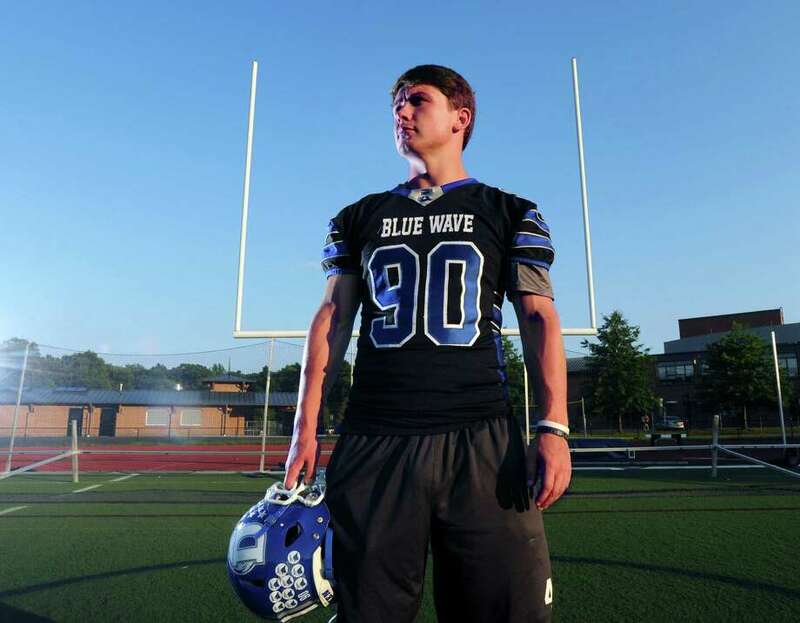 Darien’s Mark Evanchick, Male Athlete of the Year, on the football field at Darien High School. DARIEN — Mark Evanchick had heard enough. While his teammates basked in the glow of a 28-21 overtime victory over rival New Canaan in the FCIAC football final in 2014, Evanchick was busy counting down the days before he could return to the field to test his bum ankle and heal a slightly bruised ego. Lucas Niang, an imposing 6-foot-6, 295-pound tackle with a lengthy list of offers from premier college programs, had gotten the better of the Blue Wave’s hobbled pass rusher, and Rob Trifone used a recent television segment about Niang to motivate his normally reserved star. Evanchick got another crack at Niang two weeks later and delivered a monster effort, albeit in a 21-20 loss in the Class L-Large final. “In the first half against Niang, he’s got four sacks,” the Darien coach recalled last week. “It’s because Coach Trifone was under his skin all damn week about how good Lucas Niang was, and Mark Evanchick stinks. FOOTBALL: Defensive end graduated with 66.5 career sacks, surpassing the state record held previously by Dwight Freeney (60) … Set school records for tackles for loss (39) and sacks (23.5) in a season … Walter Camp Connecticut High School Player of the Year … Gatorade State Player of the Year … CHSCA All-State first team, All-FCIAC first team defense, Walter Camp All-Connecticut defense … Had team-high 89 tackles, two forced fumbles … Blue Wave finished 12-0 and won FCIAC and Class LL titles. LACROSSE: State Player of the Year by U.S. Lacrosse for second straight season … Played in Under Armor All-America game … CHSCA All-State first team, All-FCIAC first team defense … Blue Wave finished 23-0 with FCIAC and Class L titles, and was ranked second in final MaxPreps Xcellent 25 National rankings. Fast forward 12 months and there was Evanchick, kneeling amidst a sea of elation following a 39-7 throttling of Shelton in the Class LL final. The win put a bow on Darien’s unbeaten season and cemented Evanchick as arguably the most dominant defensive lineman this state has seen. Much to the chagrin of his coaches and delight of opponents, Evanchick’s illustrious four-year run at Darien finally came to a close this spring. In a familiar setting, Evanchick, a shutdown defender, celebrated yet another championship on the lacrosse field. Evanchick, the Hearst Connecticut Media Male Athlete of the Year, first opened eyes on the gridiron while playing up an age group as a seventh-grader. Too heavy to play alongside his classmates — Evanchick weighed roughly 205 pounds his father, Joe, recalled — Evanchick shared the field with the eighth-graders. Equipped with the foot speed and physical strength needed to adapt to the position, Evanchick more than held his own against players slightly older than him. By that point it had become clear Evanchick had a bright future in football. Evanchick also picked up lacrosse at a young age, first as a goalie and later as a long pole defender. Once he arrived at Darien, a program oozing with success, he became the first freshman to start on defense. It turns out Evanchick developed into more than just an average starter. U.S. Lacrosse named the University of Pennsylvania-bound defenseman the Connecticut Player of the Year as both a junior and senior. With just 48 seconds left before halftime in Darien’s eventual 27-0 blanking of Staples in November, Evanchick etched his name into the record books by taking down quarterback Andrew Speed. It was career sack No. 60.5, breaking the state record held by former Bloomfield High standout and current NFL veteran Dwight Freeney. Following the game, Evanchick was presented with a video on the school jumbotron of Freeney congratulating him on the record. There were times when Evanchick was close to unblockable. He registered a school-record 23.5 sacks as a senior and 66.5 for his career. Darien captured its first state crown in 19 years, and Evanchick scooped up nearly every postseason award there was to offer. “I used to tell the officials they were going to hold him every play,” Trifone said. Part of Evanchick’s prowess on the field, Trifone said, stems from the work the 6-foot, 235-pound end put in in the gym. Evanchick was part of an exclusive group called the 1,000-Pound Squad, whose members surpassed 1,000 pounds combined in the bench press, squats and power clean. Once football was over and the spring rolled around, Evanchick was required to trade strength for speed in order to get ready for lacrosse. Fortunately, that never became a problem. Why is the state’s career sack leader opting to play lacrosse over football in college? Evanchick has a simple answer to a question he’s been asked many times before. As good as Evanchick was in football, Lutz said, he might have been even better in lacrosse. There were many instances, the former assistant recalled, when Evanchick was so good he made the opponent’s top scoring threat irrelevant. And that’s perfectly fine for Evanchick, who’s never been one to boast despite his celebrity status around Darien. Evanchick preferred to let his play do the talking, particularly in Darien’s thumping of Southington in the Class LL semifinals. Motivated by the barbs lobbed his way after beating out quarterback Jasen Rose for Gatorade Player of the Year honors, Evanchick helped the Blue Wave register a 49-7 thumping. For the foreseeable future, Evanchick plans to put football on hold and focus on lacrosse and his academics as a possible finance major. As remarkable as the past was, he’s ready to see what the future holds.